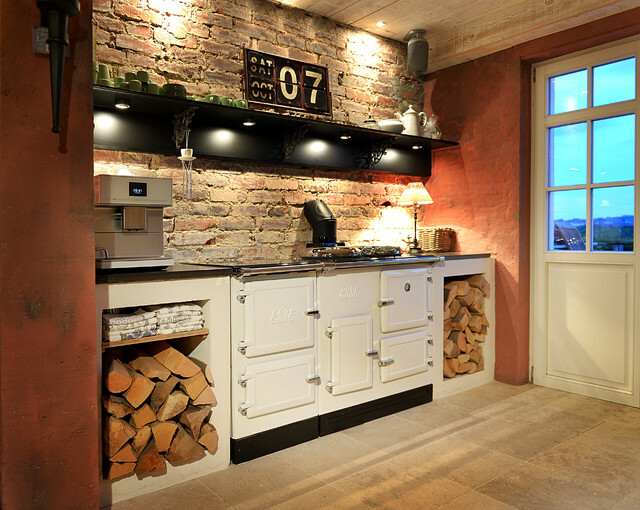 This kitchen exudes winter warmth and cosiness, particularly with the warm, spot lighting. The terracotta red offsets the pastel shares of the exposed brick wall to add to the overall feel. The built-in woodpiles and arger hark back to a previous age without feeling dated. I love the sections with the wood in them. Ob für Ihre Innenwände, die Fassade oder Möbel - mit dem HORNBACH Farbmischservice können Sie mehr als 35 Produkte in über einer Million Farben abtönen lassen.